Shelf Pet Models | Gentlemen, start your engines! 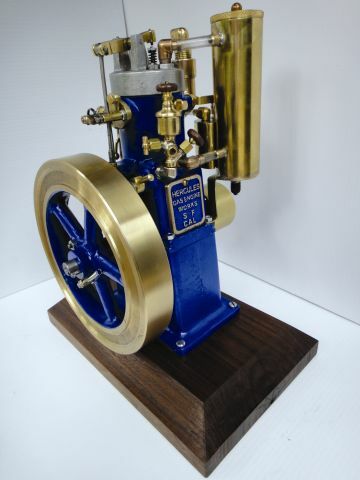 A vertical hit and miss engine with an open-sided crankcase, a side-shaft with its wabbel-plate cam on top and a fly-ball governor, makes this model engine unique and very desirable among model engine kit builders. A vertical engine with an open-sided crankcase, twin side-shafts with twin igniters on top of the cylinder heads, is a must have for model engine kit builders. 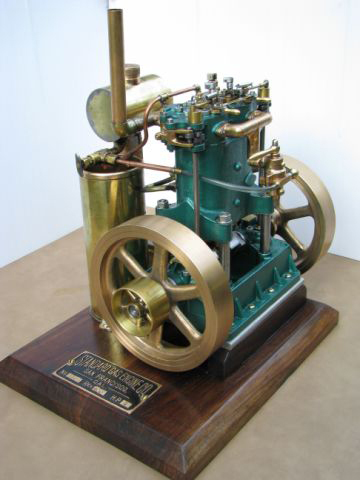 This vertical hit and miss engine has open-sided crankcase. This engine is approximately 1/3 scale of the 1-3/4 horse power engine. The bore is 1-3/8", the stroke is 1-1/2". The flywheel diameter is 7-1/2". The crankshaft length is 8-3/4" with 1/2" main and rod bearings. 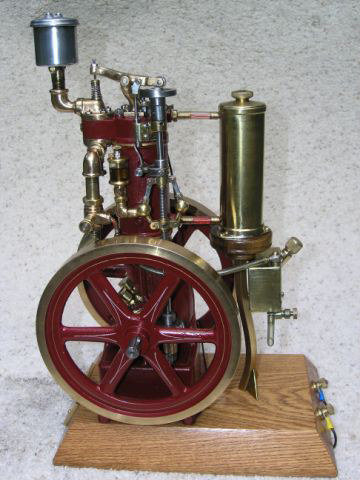 The model engine stands approximately 12" tall and weighs at least 20 lbs.